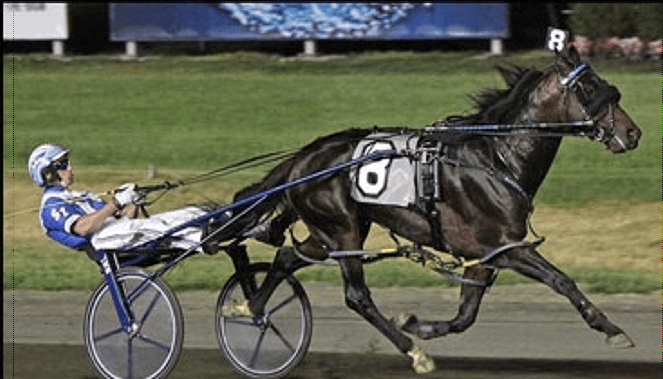 EAST RUTHERFORD, NJ – Artspeak and Mission Brief, both champions last year, pulled off victories last night at the Meadowlands in $100,000 New Jersey Sire Stakes race, but what a contrast in the way they did it. Artspeak did it spectacularly easy with a breathtaking performance, making a brilliant move down the backstretch. Mission Brief struggled throughout even when leading and had to fight back after surrendering the top in the stretch drive but still managed to hold on. Artspeak, a son of Western Ideal out of the Artsplace mare The Art Museum, started from the eight post in the field of nine, and regular driver Scott Zeron showed patience at the start of the race to settle into fourth. Gokudo Hanover, driven by John Campell for trainer Douglas Hamilton, blasted to the front from the sixth hole through an opening quarter of 26 3/5 with a brief lead over Hurrikane Ali, the 8-5 second choice in the field driven by Yannick Gingras. At that point, Artspeak was fifth by eight lengths. Hurrikane Ali made a move to overtake Gokudo Hanover, but Zeron had already pulled out and was making a sweeping move that had the colt second by three quarters of a length after a half in 54 3/5. And there was simply no stopping the 7-10 favorite, who reached the three-quarter mark comfortably in 1:21 3/5, leading by two lengths and three and a half lengths at the top of the stretch. Zeron had the horse all wrapped up at that point and coasted to a three-length win in 1:48 4/5. Gokudo Hanover, 8-1, finished second, followed by 13-1 longshot Revenge Shark and Hurrikane Ali. With his second consecutive win of the season and 10th in 12 lifetime starts, Artspeak collected $50,000 to raise his career bankroll to more than $800,000. He paid $3.40, $2.60 and $2.20. Gokudo Hanover paid $4.00 and $3.20. Revenge Shark paid $4.00. The exacta paid $13.80 and the trifecta $48.20. Trainer Tony Alagna said after the race that he and the connections would talk about the horse’s next start, and while he suggested they will likely bypass next week’s Somebeachsomewhere Stakes at Mohawk and go right into the North America Cup eliminations on June 13. It’s similar to the route Alagna took with Captaintreacherous, who was owned by almost the same partners that own Artspeak. Alagna marveled at the colt’s speed. “He’s more like a sportscar,” Alagna said. “I always tell people it’s like stepping on a gas pedal of a sports car. Marvin Katz, one of the owners of the colt with Brittany Farms, Joe Sbrocco and The Gym Partners, was absolutely taken aback by the colt’s latest win. Katz pointed out that Zeron was using a slightly different bike than the one he normally uses because of the colt’s powerful stride. Katz said the reason why Artspeak may skip the Somebeachsomewhere is because of the intense schedule that the colt will likely have this year after a patiently-managed two-year-old campaign, almost similar to Captaintreacherous. Mission Brief, last year’s champion two-year-old filly trotter, started furthest out in the field of 10 and Gingras let her find her stride while crossing over to the middle. Marion Millionair, an 18-1 long shot who had the rail, set the early pace with an opening quarter mile of 28 4/5. Gingras, who had his horse second by 1¼ lengths, grabbed the lead and had a two-length advantage after a half in 58 2/5. But Model Behavior, a 28-1 outsider driven by Tim Tetrick, was making a serious move at the 1-5 favorite and led by a nose after three quarters of a length in 1:27 1/5. Model Behavior increased the lead to a head in the stretch, but Mission Brief stayed strong and flat and passed her challenger on the inside to win by a half length. Mission Brief, trained by Ron Burke, who owns the fabulous filly with Our Horse Cents Stable, Jerry and Theresa Silva and Weaver Bruscemi, won in a time of 1:54 3/5, finishing the final quarter of a mile in 28 4/5. Model Behavior placed second, followed by Riley’s Dream. Mission Brief, with her second consecutive win of the season and 11th in 15 lifetime starts, collected $50,000 to raise her bankroll to more than $653,000. She paid $2.40, $2.10 and $2.10. Model Behavior paid $10.80 and $4.40. Riley’s Dream paid $2.40. The exacta paid $22.60 and the trifecta $67.40. “Warming up she actually felt pretty good,” Gingras said. “In the race, you know she’s not 100 percent. Now we’ve got a month and Ronnie can try a few things with her and see what’s going to work. The filly is not scheduled to race for a month. The big question is whether she will be entered against the boys later in 10 weeks time for the Hambletonian. Canepa Hanover, a half-brother to 2006 Horse of the Year Glidemaster, raced a monster mile in a $100,000 NJSS race for three-year-old male trotters, stopping the teletimer in a swift 1:51 1/5, stamping himself as a serious contender for the Hambletonian. Driven by Gingras for trainer Jimmy Takter, who is in Sweden for Maven’s race in the Ellitloppet, Canepa Hanover made an early move for the lead from the four hole and was never headed, setting fractions of 28 for the opening quarter mile, 56 2/5 for the half and 1:24 through three quarters. With every step he took, Canepa Hanover simply drew away from the field, finishing the race 3½ lengths to the good. French Laundry, also trained by Takter, finished strongly for second, while Aldebaran Eagle finished third. Canepa Hanover, third choice in the field at just over 5-2, paid $7.40, $3.40 and $2.40. French Laundry paid $3.20 and $2.20, and Aldebaran Hanover paid $3.60. The exacta paid $22.40 and the trifecta $71.40. The win was only the second in 10 lifetime starts for Canepa Hanover, who has banked less than $100,000. He was purchased as a yearling for $300,000 and is owned by Katz, Brittany Farms, Al Libfeld, Sam Goldband, Brixton Medical Inc. and Christina Takter. Canepa Hanover raced only six times last year, winning once and finishing second in another. Takter practiced patience with the colt, and had the owners’ full backing. Katz, still in awe of Artspeak’s race earlier in the card, was equally impressed with Canepa Hanover. “Jimmy liked him a great deal training down as a two-year-old,” Katz said. “He was very high on him. He won early as a two-year-old and showed devastating ability. He just wasn’t mature enough. He’s a big colt. To Jimmy’s credit, he stopped early with him without beating him up. He kept him on his farm and started back with him and has always felt this horse has a ton of ability. He was very high on him, and by mid-winter he spoke glowingly of him. He qualified him in 1:52 2/5. You don’t qualify trotters in that time unless they are exceptional. It’s a tribute to Jimmy’s talent and experience and skill as a trainer. Takter also trains last year’s champion two-year-old colt trotter Pinkman, whom Gingras drives. “It’ll all take care of itself,” Katz said. Katz was also proud of the effort of French Laundry, whom he and Libfeld bred and own with Christina Takter and Jim and John Fielding. French Laundry won seven of 12 races last year and more than $300,000 and was victorious in his season opener.